Need to warn pedestrians about hazards or "authorized access only" areas? 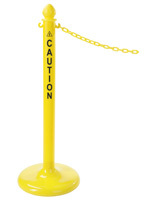 These safety stanchions are made to be easily visible from a distance to catch the attention of passersby. 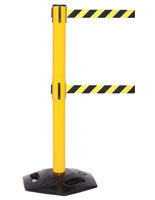 Each post additionally includes a retractable belt that with black and yellow stripes in a recognizable "caution" pattern. 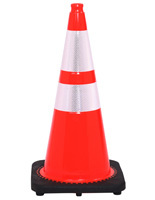 Safety stanchions and cones like these also feature bright, noticeable finishes in orange and yellow. 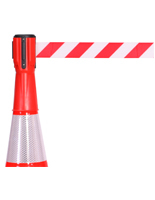 The barriers are great for creating lines or cordoning off hazardous areas and restricted doorway. In addition, each stanchion, or crowd control pole, features a high quality construction for use in heavily trafficked and industrial environments. These systems are available in two main designs to meet the needs of any customer. What kind of retractable belt fixtures are available and where can they be used? 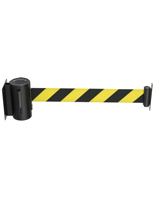 The safety stanchions are available as singular wall mount unit with a long yellow and black tape for blocking off areas. The retractable belt systems are made of strong steel with a neutral black finish that will blend into any environment, especially when the strap is not in use. Each of these units have a 3-way adapter for connecting to other stanchions and wall mounts. 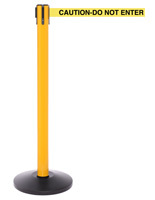 With their 8.2' long retractable belt, they can be used to block off large doorways or other areas with multiple lines. 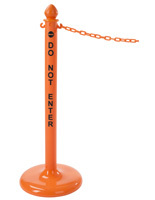 Stanchions are also available in the classic "crowd control post" design that are often employed by cafés and banks. 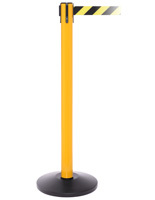 Each of the poles measures 40" tall and features a wide base for maximum stability. 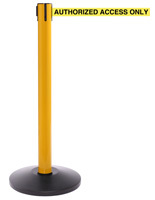 This type of stand features a bright yellow finish with a black weighted base and straps in various lengths. This included tape can be printed with messaging like "Authorized Access Only" or "Caution-Do Not Enter" or the previously mentioned stripe pattern. With their strong stainless steel and cast iron fabrication, they can be placed in any location. The barriers' weighted base makes them ideal for events as well because of their added stability. Some stands feature a weatherproof design for outdoor use. 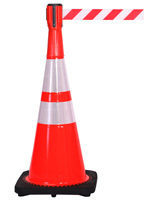 Another type of crowd control system available here is the traffic cone with or without a caution strap. Like traditional barriers, they have a bright orange finish, but they come with two white reflective strips for even more visibility. 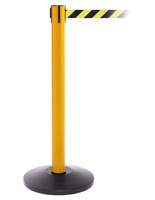 Similar to line stands, these fixtures feature different lengths of tape for different uses. 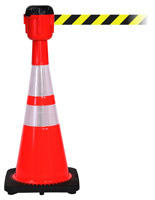 This type of barrier is ideal for construction zones and outdoor use because they're made of durable PVC. However, they can be placed indoors as well and will easily capture attention with their vivid color scheme. 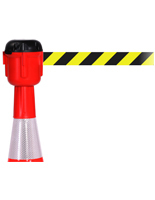 The included caution band on the line posts and cones are made of durable nylon that won't fray or break when under stress. These systems also feature a locking mechanism that prevents accidental release. Order one or more of these fixtures to prevent pedestrians from entering a work zone, a hazardous environment or an area for VIPs only. While many models feature a weighted base, they have a portable design that makes them excellent for transport to new locations and events.